Is there any way of fixing these joists where the plumber notched out 2/3rds of the 3 joists? Can I put metal strapping on the bottom, or maybe a bracket? that's a lot of wood hacked out of there. likely need an engineer to prescribe a fix for that mess. As said above, an engineer might have an answer, if you are wanting to leave it as is. Possibly a flitch plate? For me, I would cut out the plumbing, sister the joists, and find a new route for the plumbing pipes, which would avoid cutting anymore of the joists. Of course there is a difference between notching a joist and drilling a hole. Drop the pipe down into a soffit. Soffits aren't the greatest but they are better than structural failures. Beat the plumber and the GC. Is that a 4" pipe? Why so big? I see a lot of HO's run 4" waste lines when 3" is fine for more than one toilet. All that work to save (1) $3.00 45° fitting. cut out that pipe and beat the homeowner/diyer over the head with it. Will the plumber pay for the electrician to remove and reinstall his wire too after you sister it? Will the homeowner/diyer pay for the homeowner/diyer to remove and reinstall his wire too after you sister it? It's understandable. He probably didn't have the fitting, he was running late, and he still had to get back on the road. Two Long radius 90s or Four 1/4 bends= easy to snake, fewer plugs. Run the DWV pipe into the left wall using correct high flow fittings,, re pair And or replace cut joists, go British and leave it exposed. Well, thank you all for your input. I have decided that because the ceiling is very tall that I will order THA213 hangers and hang 2x6 ceiling joists under all of the existing 2x8 joists and drop the ceiling. Basically a large soffit. Do you see any problems with this? Besides how to hide the body of the plumber that did this? Good catch, those look like vent fittings. The elbows still need to be replaced with turd rated bends, is there a vent stack for code issues close enough for the stool to work correctly? I love high ceilings,you could screw on 2x6 sideways under the old joists everywhere, I'd still install some Simpson 1.5" wide straps under the notches. remember jack the old wood up to flat prior to attaching any new materials, so old material isn't over tensioned. That PVC will support the floor load don't worry about it. Seriously you could double up and header it but it would be a big PITA now. Those aren’t vent elbows, just standard. I’ve never seen a plumber around here use a long sweep, and they rarely use 45’s. 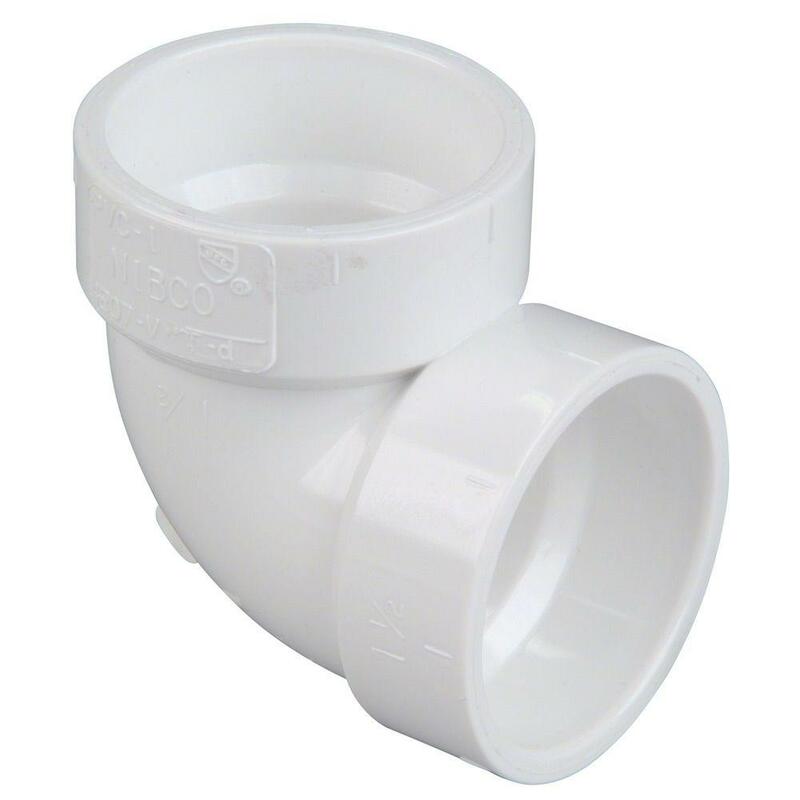 I finally asked my current plumber about it a while back and he said he likes to get the pipe close to a wall as soon as possible so 90’s are his way. I think it’s because it’s faster and easier to figure out the run. 45ing a run takes more precision. Last edited by Big Johnson; 02-06-2019 at 07:44 AM. That entire floor system is hosed. What an idiot. What Ed said, that would be the best solution and a less costly one to resolve this and drop the pipe into a soffit. That said, what the other side looks like where the pipe is coming from? There is no wall nearby where that pipe can be dropped into the basement? I mean I never had to run a sewer pipe or seen anything like this where there was a need to run a sewer pipe across the entire floor subframe even in the old Homes built from the '20s and up they never did that with a sewer pipe for the toilet, there is always a straight run between the joist cavity to the nearest wall to make the drop. 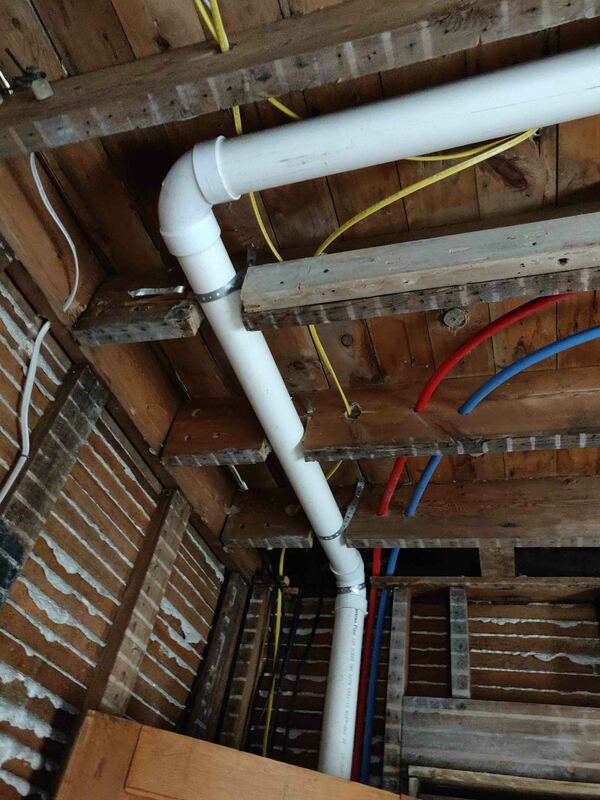 In some cases when faced with bathroom remodeling and when plumbing being re-routed because they want to move a toilet, etc and the toilet ends up in some location where there is nothing nearby to drop a pipe you would make floor joist modification to something like the picture attached, but any contractor or an architect always try to avoid sewer pipe re-routing because it can be costly. I'm sure there is a much better way to get that pipe down because if the plumber did this he definitely doesn't know much what he is doing. Forget about the straps or plates, you obviously don't know much yourself about the structure or floor loading to even think that. If you use straps or plates that floor will be like a trampoline and that if you don't end up collapsing the floor first. Last edited by greg24k; 02-06-2019 at 09:42 AM.